In Fusioo, Apps are used to store and display structured data. For example, you would create the Projects App and Clients App to store and manage projects and clients respectively. When creating a new App, you should always be asking - What do I need to track and manage? 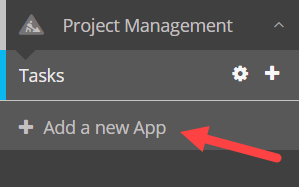 If your new App is used to track and manage Projects, you should choose a descriptive name, such as Projects. This way, Fusioo will be able to generate the name for a single record - in this case, Project. If you don’t like the auto generated name, you can change it any time you want. Add Fields to structure your data. E.g: Project Budget, Project Description, Project Duration etc. For a more detailed explanation, check out the following guide: Creating your first App. Dashboards are used to visualize App data. Creating Dashboards is a matter of dragging and dropping the widgets that are required to visualize the App data. Widgets include List Views, Bar charts, Pie charts, Numeric metrics and Sorted lists. When your need to track additional information, you can modify your existing Apps to fit your new workflow. You can modify an existing App’s Fields either from the List View or from the Fields page. You can also add widgets or configure existing Dashboard widgets.